We thank God that we have arrived at the place where all the promises of God that He made concerning the wife of the Lamb is now fulfilled or being fulfilled. And that's why God has revealed His Word to us, the wife of His Son. As Paul's vision of the wife's final moments come into our revelational view it shows that it's time for the living members of the wife to receive the fullness of the projected events, thus fulfilling Paul's writing of we which are alive and remain. Now we understand that part of Paul's message was fulfilled back there in the time of his writing. We can look back to the time of his writing and see part of it, knowing much of the things he said was Word for the church as it existed then. But there's a prophetic part, a projecting forward part. Paul in his vision did not see many of the things that John wrote about in the Book of Revelation. I say this because he did not make reference to those future happenings in his writings. When he was writing, his thinking was that he would still be living when it all took place, because he said, "We which are alive and remain." He included himself in the fulfillment of his end time projection. But as history lets us know, the church fell away and Christ didn't come in His fullness as expected by the early Gentile church, which was the engaged bride. Paul actually thought he would be the one that would present the virgin that he introduced to Christ in marriage, but it wasn't to be at that time. Now we understand that it will be Christ, the anointed body in the earth that we are baptized into that does the presenting. 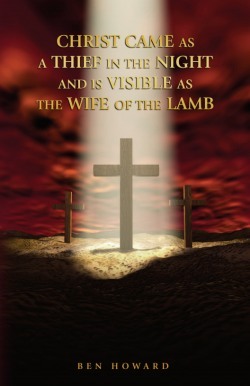 It's the Christ in the earth as the wife presenting herself to her husband, the Lord Jesus Christ, as a perfect wife. Paul's message pointed forward to this in Ephesians 5:27, saying, "That he might present it to himself a glorious church, not having spot, or wrinkle, or any such thing; but it should be holy and without blemish." At this time we become bone of His bone and flesh of His flesh (Ephesians 5:30-32) and have also become Spirit of His Spirit. (1 Corinthians 6:17) So we have come to the place where we are no longer tossed to and fro and carried about with every wind of doctrine, and the body is edifying itself in love. In the Book of Revelation 10:11, it says, "And he said unto me, Thou must prophesy again before many peoples, and nations, and tongues, and kings." The prophecy that's spoken of here is the message that is now taking place and going forth. But there is something after this. Revelation 10:11 takes place before Paul's final prophetic projection comes into being. This prophecy of Thou must prophesy again is going forth now because it has to precede the final projected prophecy of Paul, which says, "We will be changed in a moment in the twinkling of an eye, and be caught up to meet the Lord in the air." Paul's projection is for those that are alive and remain. We are that group that is alive and remaining, and this prophecy is fulfilled in us. So it brings us to giving this explanation. There are those that remained from each of the seven church ages; then when another age began the remaining saints of the just past age moved over into the beginning of the new age, and became a part of the saints of that age. But at the end of the seventh age there is not another church age for the living to move over into. This is where a time period that is known in the scripture as the silence in heaven for half an hour begins to come into the picture. Since there were no other church ages, the mystery of God was finished. (Revelation 10:7) This mystery related only to the church ages and that was over with at the death of William Branham. This mystery is a singular mystery and did not relate to all the other things that were needful for the wife of the Lamb to understand before the marriage and rapture. And here is where the ministry of Brother Raymond Jackson, the apostle of this silence in heaven time period, comes into plain view and shines forth the light for those that are alive and remain from the seventh church age. I am only speaking of the predestinated seed that heard the revelational truth that God gave this apostle. It was during this time that the silence in heaven period was manifested; bringing us a furtherance of truth beyond what the messenger to the seventh age left us with. This revelation continued to breathe life into the whole message of the spiritual coming of Christ as there was further revelation to go on to. This posed an insurmountable obstacle for those that remained from the followers of the seventh church age messenger. Because here God was giving more truth, but they had been told to stay with what was said by the messenger. So the furtherance of the truth that God was sending became a trap because they refused to move on into it. I preached a message some years ago about this entitled, That Which Should Have Been For Your Deliverance Has Become a Trap to You. And this being so, they had no other option but to stop and become foolish virgins, or just a religious order, where the tares love to dwell and flock together. This message that the apostle brought for this 'silence period' has brought us to Revelation 10:8-11. His work being finished as God called him home in 2004, having been faithful to his calling. Now it has become imperative for those which are alive and remain that heard and believed the apostle for that time period to move into the final part of this message that God has sent. And that is the message that you are reading in this book as we have taken the little book and eaten it. And it has produced this book that is the materialization of Revelation 10:8-11. Yes, that book has materialized and now we hold it in our hands. This is the message that the angel gave to John (the wife) to sound forth, and when it has accomplished its intended purpose then all things have been fulfilled. We will say as Jesus Christ did when the purpose of God was fulfilled in Him, "It is finished!" Then will be brought to pass 1 Corinthians 15:51-57, which shows both the resurrection of the dead members of the body of Christ and the translation of the final part, we which are alive and remain members of the wife. And off with our husband we will go, dressed in fine linen, clean and white.